I bought a bass. I actually started out a bassist and had a band (as a bassist) in high school. We were pretty popular... inside the high school. But I eventually switched to vocals and I couldn't sing and play at the same time so we got another bassist. And then the band broke up, and I switched to playing guitar. I bought a bass because I've started doing some recording at home for fun (and profit?) and I just needed something cheap that didn't sound like a guitar pretending to be a bass. 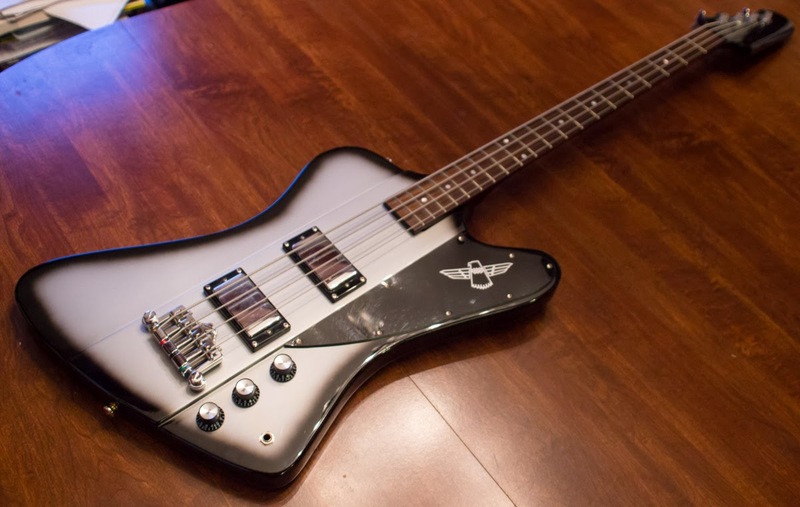 This is an Epiphone Thunderbird Bass IV limited edition in silverburst, with chrome hardware. They only made these for a few years but as soon as I stumbled across a picture online, I knew I had to have one. I mean, considering I was in the market for a cheap bass - I'd still rather have either a MIA Fender or Gibson. But this is definitely the coolest looking of all the cheap basses on the market. It seems to be built pretty well and it sounds good, at least through my Yamaha THR10. It is still a Chinese-made Epiphone and it's not perfect... but then my $1,400 MIA Jazzmaster isn't perfect either, so there's that. The neck's a bolt-on, unlike a proper Gibson, and it's slightly out of alignment. I can fix that easily, but it'll happen again because the neck pocket is cut looser than any Fender I have (or my Squier Strat). I guess Fender's just better at bolt-on necks. On the backside, there are a couple of what may be cracks underneath the finish, or it may just be weird pieces of mahogany where the grain is sticking out a little. The holes in either the pickguard or the body under it are also a little out of alignment, such that the screws are all angled in and the pickguard still isn't seated right against the middle plank. I can fix that too, but I need to figure out whether it's the body or the pickguard that's mis-drilled. Anyway it's just cosmetic and only the kind of thing an obsessive compulsive guy like me would notice. My bass is also missing the truss rod cover, and I have a feeling it's because the previous owner was trying to pass it off as a Gibson, which I've seen a few people do with these. I can tell Guitar Center removed whatever was there very recently - there was still sawdust around the screw holes when it arrived. Anyway I've already ordered an Epiphone cover - if you've got an Epiphone, don't hide it like a cheeseball with a Gibson cover! You're not fooling anyone, dude. The cover was $20, which will bring the grand total for this thing to $220. Still a great deal. The nice thing about buying used is that sometimes you'll get a guitar that's already set up nicely, and that's the case with this bass. It actually plays really well. The action's low-ish, and I can tell that both the bridge and pickup heights have been adjusted by looking at the screw heads. Overall it's in really nice shape - it's scratched up just enough that I can tell it was well played, but cared for. Liking it a lot so far. It's badass. And it makes my other guitars look like ukuleles. It's huge, which suits me fine. I remember now why I started on bass to begin with. I hope this doesn't turn into another expensive hobby!